(I always seek out articles that you might find useful on various topics. This time, its Fall outdoor planting. These are high impact easy care celebrations of Autumn with color, texture and seasonal accents. A few colorful fall containers or a potted Japanese maple tree can go a long way in providing a seasonal pick-me-up to a porch, patio, balcony or other small outdoor space. For inspiration, take a look at these nine high-impact planting vignettes that combine some of our favorite plant ingredients, including mums, fall foliage and more, to make a big impact in a small space. 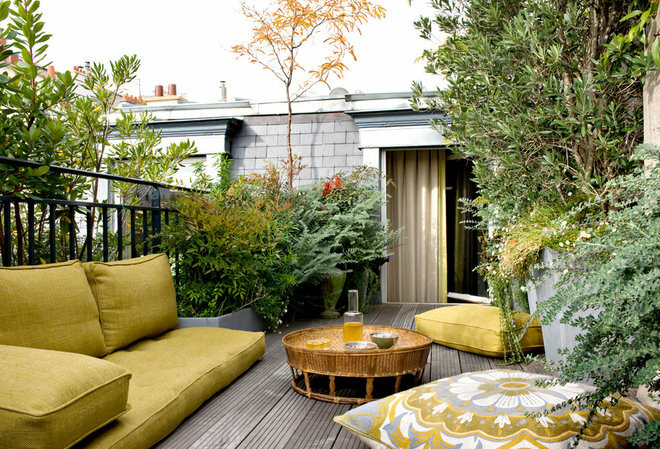 Clustered containers filled with layers of foliage plants help make this Parisian rooftop feel like a secret garden. Relying almost entirely on greenery, save for a few Latin American fleabane tucked in around the edges, this garden likely requires minimum maintenance in spring and summer and creates a lovely setting for fall. Many of the plants, including heavenly bamboo and a small deciduous tree, are just beginning to take on fall colors in this photo. 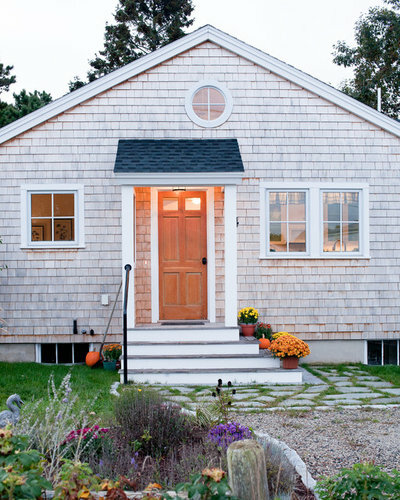 There’s something to be said for sticking with the classic pairing of pumpkins and potted mums for a quick and easy porch update for fall, as did this home in Maine. If you don’t have steps to add height variation to the display, use an overturned galvanized bucket or wooden crate to boost up mums in the back, and fill in the front with other potted plants and pumpkins. 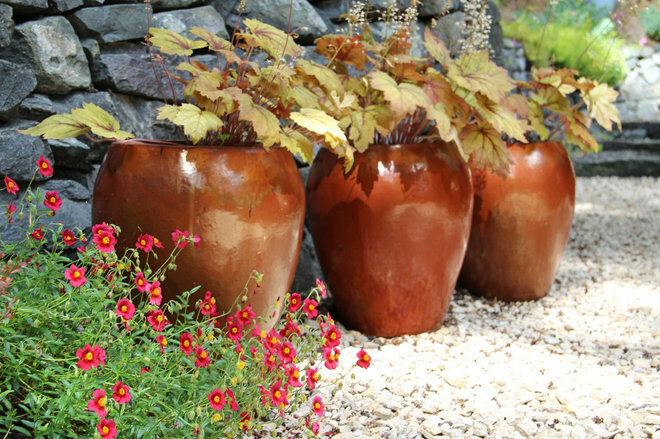 In small gardens the color of a plant container can make just as much of an impact as the plants themselves. Bronze-colored containers in this garden in Bainbridge Island, Washington, add a warm hit of color, emphasized by their repetition against a dark stone backdrop. 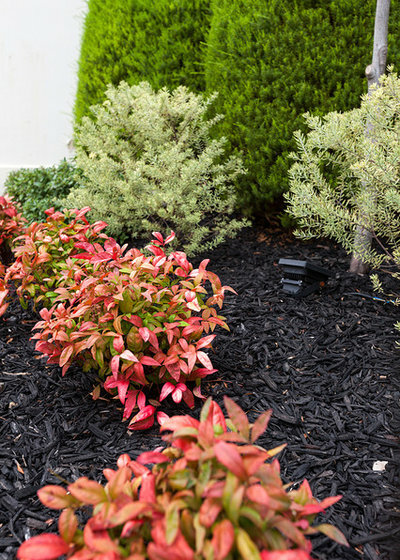 For a similar effect in your garden, start with a container in a seasonal hue, such as bronze, terra cotta, burgundy or dark red, and fill with foliage plants in a similar or complementary color. 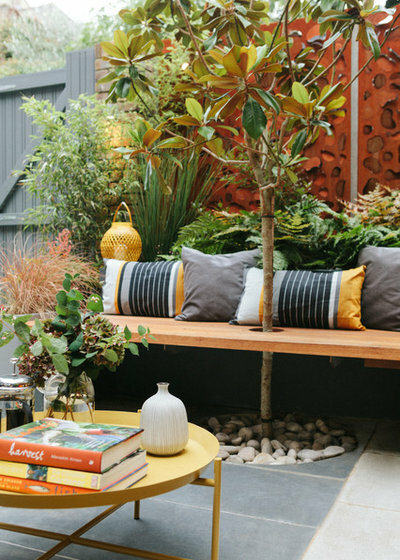 The designer of this outdoor space in the Camden neighborhood of London used a rich color palette of bronze, gold and charcoal gray to warm up a small urban garden. Dimensional Cor-Ten steel wall panels — designed to be illuminated from behind — form a textural, rust-colored backdrop for foliage plants, which include bronze-tipped autumn ferns, bamboo, carex and a magnolia tree growing through the bench seating. 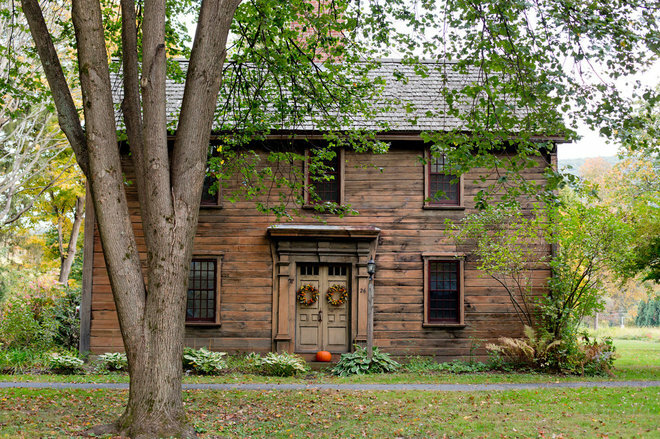 Defining a home entry with an arbor enhances curb appeal and creates a sense of arrival. 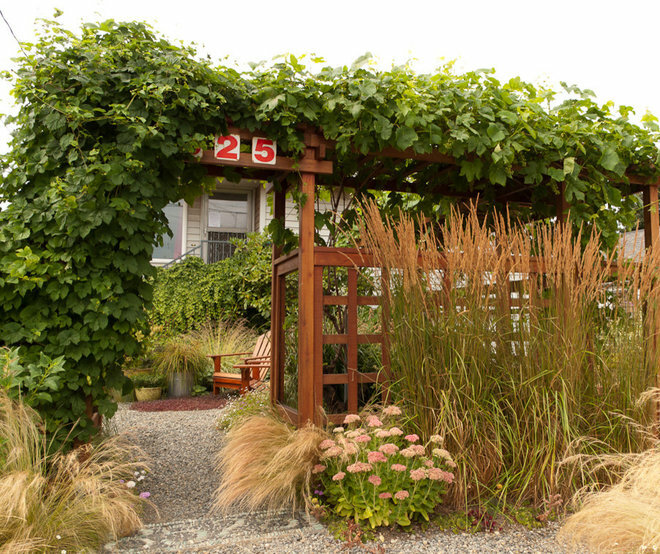 In this garden in Seattle, a combination of tawny grasses, cascading grape vines (the leaves take on fall colors as the season progresses) and easy-care ‘Autumn Joy’ sedum form a rich fall entry in a small space. ‘Karl Foerster’ feather reed grass, the tallest grass shown, is particularly useful for adding visual drama to a small space, as it stays narrow but can reach 4 to 5 feet tall. The classic fall pairing of mums and ornamental grasses appears on this New England porch in hanging baskets. Most of the mums sold at the supermarket or nursery this time of year are “bedding mums” and are bred to stay short, bushy and produce maximum blooms. They can be planted into garden beds at the end of the season (in mild climates) or next spring (in cold climates), where they’ll often grow taller than their container-grown height. 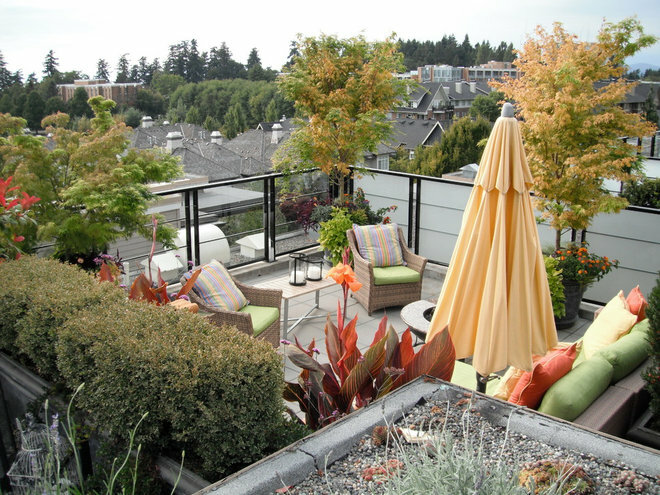 To turn a Vancouver rooftop into a leafy retreat, designer Glenna Partridge arranged containers around the edges of the seating area and planted them with Japanese maples and an exuberant mix of trailing lantana, sweet potato vine and purple heart. Japanese maples are some of the most dramatic small-scale trees for fall color. Choose among those with leaf hues ranging from deep burgundy to brilliant gold. In small gardens in mild climates, try growing dwarf heavenly bamboo in the ground or in containers. Unlike the standard version, which can reach over 6 feet tall, dwarf varieties often reach only 3 feet tall and wide in a few years. The leaves take on a brilliant red tinge with full sun exposure. Red berries form in fall and remain on the plant through winter. 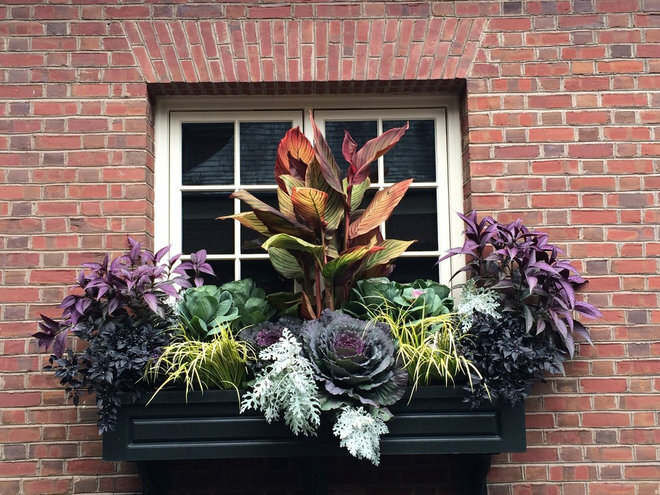 This autumn window box in New England is bursting with jewel-toned plants, including ornamental cabbages, bronze canna, strappy sedge, silvery dusty miller, dark purple ornamental peppers and medium purple Persian shield. The high contrast of adjacent foliage hues — silver leaves right next to a dark purple cabbage, for example — makes the entire combination appear to nearly pulse with color. 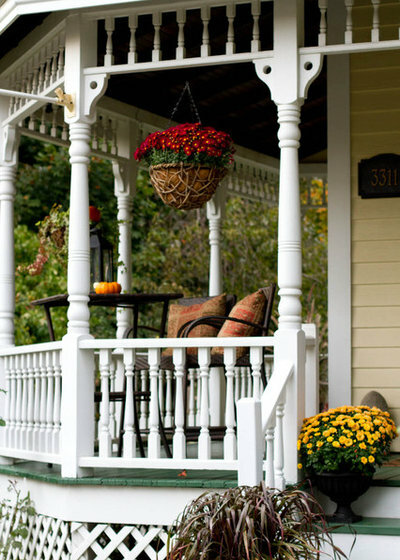 Your turn: How are you getting your porches, balconies and small gardens ready for fall? Show us your best photos in the Comments.